to the Greek religion of Dodecatheon. We are all who believe in our patrimonial Greek religion, the illustrious religion of the Classical Era: the Hellenic Religion of the Dodecatheon (=12 Gods). Many of us received this faith as a valuable heritage from their families, because ancient greek religion managed to survive, despite the cruel and ruthless persecutions by the Byzantine and Ottoman regimes, to transfer itself through generations, despite theharsh conditions prevailing due to christian despotism, thus succeeding, with the help of our Gods, to keep our sacred oral tradition intact up to the present day. With these thoughts in mind, we made our existence known to the appropriate government authorities and also recorded our Basic Principles and our Main Formals. Thus, we started appearing in public as a «known religion» (= legal term of the greek jurisdiction). 2. What is religion? Why are we religious? How many religions exist? Many might consider it strange to be religious; thus they'll ponder: Why are you dealing with religion in our times? Why are you religious? Doesn't religion fit more all those that still live in medieval times, in regression, in the world of "chador" and "people's demonstrations" (of Greek Orthodox Church)? No my friend, religion is to put fundamental questions forth and then answer them. What is the Cosmos? What is Man? Which values should be life-values for us? All people have an, usually unconscious, point of view regarding these questions throughout their lives, and with every actionthey take and every decision they make, give answers, which arise most of the times from erroneous viewpoints acquired from school or from their social environment. However, the purpose of the conscious, cultured human is to be able to be master of his own decisions, as the Greeks of the Classical Era were. The prejudice against being religious is caused by the following fact: There are two kinds of religions in total: First, the ancient traditional religions that carry all the wisdom of the Golden Era, about which the classic writers talk, and have answers for the meaning of life and the Cosmos, thus, fulfilling the human search for the holy. These answers in the measure in which every traditional religion maintained the Golden Era ideas are valid, given by the Gods, and at the same time scientific, founded on the higher science of the antediluvian civilization. This knowledge is retained in its fullness and authenticity in the Hellenic Religion of the Twelve Gods. Second, there exist the cosmopolitan monotheistic religions of the Late Antiquity. These were developed in the cosmopolitan environment of the Roman Empire and they are not, in reality, ways to approach the Holy and Sacred, but authoritarian systems, which mobilize police forces and state violence to keep people captive. Committing humans to superficial formalities they exert their power by creating fear and guilt feelings through doctrines counter to nature, unheard of prohibitions and imaginary "original sins". This is why these elements strike us as medieval: "chador", devils, kneelings, fasts, adorations, "miracles" and exceedingly simpleminded doctrines. These religions are the ones known to most of the people, thus being religious has come to mean regression and illiteracy! 3. How did we get here! Our Hellenic religion, being a genuine descendant of the Golden Era has produced masterpieces, creating the miracle of the Graecoroman Classical Civilization, but at the moment when this civilization reached its consolidation and was about to be stabilized, the cosmopolitan religion of Christianity managed to gain the favor of emperor Constantine, although the proselytized masses of the big cities (mainly immigrants from Middle East and a few Jews) amounted only to around 5% of the population total. This seizing of the state's machinery was followed by a storm of laws and prosecutions which not only violently annihilated Hellenic Religion, but the libraries were closed and put to fire, the Philosophical Schools were rescinded, together with the Theaters, the Public Baths, the Olympic Games, the autonomous states, and even the national celebrations of the victory against the Persians. In general, every element of the Hellenic Civilization was destroyed. Through the use of the battle cry "believe or die", the christian monks and soldiers tried to destroy the ancient world! So some Hellenes "believed", many were put to death and Hellas was reduced to an uncared-for section of the multinational Byzantine nation. A big number of Hellenes managed to retain their religion within this horrible situation. Many of them established secluded villages in inaccessible places, while the major part was organized in the cities. The last days of Byzantium were reached thus, when while the orthodox part of the state had already decided for the "Ottoman kerchief", the Hellenes appeared in public to save Greece from the Ottoman flood. National reformation and return to the ancient polytheistic religion was put forward, through Georgios Plithon-Gemistos and by publication of his "Laws". The results are known, unluckily the ruling class was won over by the pro-Turks thus the Hellenes by religion were forced to organize their survival within the Ottoman state. After the establishment of the New Hellenic nation (1826) and the slackening of the absolute orthodox censorship, lots of texts appeared, which expound on Hellenic Religion, thus preparing the way for us to reach the historic moment of our official appearance. 4. What do we believe in? Our religion is genuinely traditional and hence it believes that there exists nothing else except the natural system that we call Cosmos. Cosmos is everything that surrounds us, we ourselves, our Earth, the Galaxies, the Universes, but also things and entities we do not perceive, like the higher electromagnetic radiations and the Higher Worlds of the Gods, higher in spirit and energy. Cosmos is ever eternal, meaning that it existed, exists and will exist and there was never a time in which it did not exist. Notehere: Within Cosmos and through its creative powers everything is being born and then evolves. In this Cosmos the Psyches are born and start on a long journey towards evolution, which, after a great number of reincarnations, renders them perfect and evolved in such a way as to achieve immortality in the Higher Worlds of the Gods. What are the Greek Gods? The answer is simple. The Hellenic Gods are personalities and individuals, like we are, but perfect in knowledge and ethics, and also havingachieved immortality. Hence our religion is genuinely polytheistic. These Divine Entities care for the perfect operation of the natural Laws and, since they are full of interest and compassion for us and all the entities of the evolutionary chain, they take care of us with all their powers, they help us, they guide us towards good (up to where we want and up to the point we allow them, of course) and labor for our spiritual evolution. For this reason, and from time immemorial, holy institutions were established, the Oracles, the Asclepiaea, the Mysteries, all these to enlighten us, to help us, to give us golden hopes for the completion of our existence, whose evolution swiftness is in our hands. Indeed, Gods help us with reason and justice and there is really justice in the Cosmos, for when we complete the circle of rebirths and will be guided to the real Immortal life, since we are destined for that through Cosmos' rhythm, we will have also complete equality of memories because we all will have passed through all life conditions. Let us give good notice to this: Only the rhythm of Cosmos and the authority of impersonal Law exists for us. There is no "out-of-this-world" god, who directs Cosmos in an arbitrary way of «Predestination», thus saving some and condemning others. No, only the logical and unchanging natural Law exists, whose real and not arbitrary justice the Gods serve, and this same justice we owe to serve too, being in accordance to the Cosmos' rhythm, which always guides us towards our perfection according to the divine law of Evolution. In contrast, when we are in accordance with erroneous ideas which are contrary to Nature, then we fall behind evolutionally and this is entirely due to our own will and thought, because there are, of course, no Evil powers within the Cosmos, like evil spirits and devils and all these creations of the sick imagination of the monotheistic religions, created to sink humans in an imaginary world of danger and guilt, to make them delirious and put them out of reality! In contrast to monotheism, our religion believes that the Cosmos is really what exists and thus we evolve getting involved with it and not with imaginary entities out of it. This is why it is a Religious Command to develop Science, Art, Justice, Care for the city's welfare, Ecology, Attempt to improve the environment, fine Architecture, City Planning, and care for the human being itself, its culture, scientific and spiritual and physical. This is why Search, Reason, and the Olympic Games are born. 5. Its fruits judge every tree! By its command to search for the Truth, and its postulate that Truth exists in the Cosmos only, sciences were developed, Mathematics, Physics, Logic and scientific Methodology, also Theater, as a representation of Cosmos' rhythm, and Sculpture. By its declaration that Man evolves by perfection of knowledge and ethos, Classical Man was created, setting as target not only Science development, but also language development, having sculptured the magnificent Attic language, and the culture of Literature, that saw immortal masterpieces created in each one of its branches, from the immortal works of the tragic poets and the superb exaltation of the lyric poets to the unsurpassed historiography of Thucidides. It also set creative thinking development as its target, which brought forth the immortal ancient philosophers, who, based on the great truths of Greek worldvision, analyzed them both scientifically and practically [don't forget that today's Logic and scientific Methodology are not neutral ideologically but are based on the Hellenic worldvision as contrasted to the Christian or Koran worldvision!]. By its view that Man develops only as a member of society, through the progress of the fellow members, who ought to be taken care of by the other members, and by proposing that the main virtue of Man is the care of the Law and the well-being of the Country, political virtue and Man-Citizen was created, and also the study of states and institutions, the search for the best system of government, the miracle that is known as «Greek Polis» [don't forget that today's humanist values and ideas about the «droits del' Homme», the civil liberties and libertarian constitutions are not neutral ideologically but are the Hellenic Ideology and Hellenic values as contrasted to the Christian or Koran values!]. By its declaration that Cosmos is sacrosanct, ecological conscience dawned,love for the animals, and care for the environment, which is not abused but improved by unsurpassed Architecture. By its view that the substance of Cosmos and the Human Body are sacrosanct,the development of the unsurpassed Medicine of the Asclepiaeum, [don't forget that this medicine is the mother of today's western medicine as our medicine has be born by the books of Hippokrates and Galen] and physical education was achieved, which resulted not only in the glory of the OlympicGames, but in the creation of a society of medical care and health. There are more and more, my reader friend, that have no end and you can compare them with the fruits of the monotheistic religions, that is, with lawless societies of Byzantine type, where the law of silence, prevailed, where every little deviation of thought is punished with death by the Inquisitor, with societies of excessive illiteracy and ignorance, societies that "believe and do not search", that curse and prohibit Science and Art! 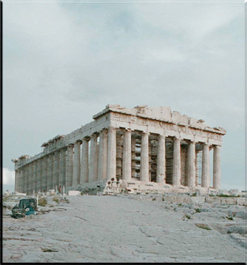 The fruit of the Hellenic Religion tree is Classical Civilization, with its infinite and up to now unsurpassed aspects. Let the others show us the fruits of their religion! 6. A Religion for today's Man! a. By the primary virtue, the virtue of man as a citizen, our religion sets the foundation of human cooperation, social life, care for the environment and the city, and adherence to establishing healthy institutions, laws and political systems. In this way, societies are produced that operate in harmony, and Man is turned away from the gruesome and destructive ideal of self-salvation, which destroys society and people's souls, converting them to blood-thirsty animals. b. By the ideal of Cultured Man, our religion promotes the development of Science and Art, but also turns away Man from the current false culture of mass media and teaches the real cultural values. We should not forget that Literature, Theater, Music, Painting, Sculpture and Spiritual Search are sacrosanct institutions for our religion, all within the frame of classical aesthetics and Measure! c. By the ideal of natural life, it does not only advance natural life itself, Health, athletics and the immortal Olympic spirit, but, by religious command, draws away Man from all big city harmful addictions, and makes Man according to Classical "Measure". Let us not forget that the Asclepian institutions and the unsurpassed health commands thereof are purely religious! d. Hellenic Religion commands Man to develop though processes, to think logically and decide freely what is correct. It condemns the false ideals of the « mass man», for whom Mass Media think, and the ,believer», for whom some "Holy Synods" think. By teaching the Enlightenment ideal itcreates freethinking Man. e. For Hellenic Religion there exist no heavenly city, doomsday, inactive monastery life and other medieval ideas. Man evolves by being a part of society and participating in its life, and creative work is considered a primary virtue. Hellenic Religion honors work only, hence draws Man out of boredom and guides societies towards their progress. f. By the religious command to develop Sciences and Art, cultured, rich and thriving states are created and not theocratic fossils! Let us not forget that our religion created Classical World! g. Woman is considered not only an equal to man, but capable of greater spiritual development and aspiration towards higher conscience, compared to man. This is why Hellenic Religion reserves all the sacerdotal orders for women, even the highest ones. In every Mystery, like those of Eleysis, there is always a female hierophant holding a position equivalent to the male hierophant, and the priestess of Demeter is presiding over the Olympic Games. Even the mentionof a woman priest, rabbi, mufti, or bishop in today's monotheism sounds like a sacrilegious joke. Why indeed? You have to ask them why! We live in an era where men are equal and dignified, in an era where both sexes are equal and in an era of human rights. We live in an era of Science, Reason and Space Travel. We live in an era where arts are freely developed and athletics prevail, in the era of Olympic Games. Isn't it mandatory to have a Religion proportionate to the above? If Hellenic Religion didn't exist, shouldn't there be an irrefutable need to invent it? 7. Why are we calling you towards us? We, the Committee for Hellenic Religion, invite you to join us so that we can all work together as a group to enhance and develop our spirituality. Realize that there exists within you an indestructible psychic individual that you have to take care of by seeking perfection in knowledge andethical renaissance. Gods call out to you, to guide you towards immortality. Man's life is brief, and its waste means evolutional retrogression. You, that were lucky to learn that the road to Truth exists, don't have to waste time when there's this golden opportunity awaiting for you, to adapt your life to teachings handed down by the Gods. You have to know that when you wish, you will receive abundant help from the Higher Worlds, who watch over your path with emotion and benevolence. Stop your purposeless wander in this ocean of illusion and self-deception and come to the reality of our Hellenic Religion. « Without the proper knowledge about the Sacred, none shall receive virtue, no mortal nor nation» Says classical wisdom!